Continuous innovations leading to the introduction of newer, better, and safer medical X-ray detectors are the primary drivers of the medical X-ray detectors market. Persistence Market Research in its report titled ‘Medical X-ray detectors Market: Global Industry Analysis (2012-2016) & Forecast (2017-2022)’ has undertaken an exhaustive study on the medical X-ray detectors market. The historical analysis has been compared and contrasted with the five-year forecast period ending in 2022 so that readers can get a thorough understanding of the strong prospects that are present in the medical X-ray detectors market. The medical X-ray detectors market report begins with the executive summary that is concise yet comprehensive and is the perfect first-look at the medical X-ray detectors market. It can be read in tandem with the market overview section that includes the definition and the taxonomy of the medical X-ray detectors market. In addition to this, the medical X-ray detectors market report provides the market size, Y-o-Y growth and dynamics that key stakeholders can expect to find in the medical X-ray detectors market. The medical X-ray detectors market report also discusses the relationship between various nodes in the supply chain and focuses on the cost structure and pricing analysis that exist in the medical X-ray detectors market. A key section of the medical X-ray detectors market report highlights the market analysis and forecast on the basis of product type. The revenue, market share comparison, and Y-o-Y growth comparison has been given for indirect flat panel detectors, direct flat panel detectors, computed radiography, line-scan detectors, and charge-couple devices. A market player that wants to target only a specific product type of the medical X-ray detectors market would find this section very useful indeed. The global medical X-ray detectors market has been studied on the basis of six key geographic regions viz. North America, Latin America, Europe, Japan, APEJ, and MEA, each of which has studied in great detail in a separate chapter. The medical X-ray detectors market report has provided important insights pertaining to the largest countries in each region in terms of the revenue figures based on the taxonomy. This can prove helpful for market players that seek to target high-growth regions in the medical X-ray detectors market. The competition in the medical X-ray detectors market is quite brutal and it would be advisable to conduct an in-depth competitive analysis before entering this dynamic, fast-growing market. The competition landscape and company profiles section of the medical X-ray detectors market serves this very purpose. This chapter has profiled some of the most prominent players currently active in the medical X-ray detectors market. A brief company overview, relevant financials, and recent company developments are what report readers can expect to find in this section of the medical X-ray detectors market report. A thorough SWOT analysis of the profiled companies concludes this highly informative section of the medical X-ray detectors market and can be particularly helpful to devise long-term business strategies. Medical X-ray detectors are deployed to great effect to measure spectrum, flux, spatial distribution and properties of X-rays. Medical X-ray detectors are primarily of two types – X-ray films and imaging detectors, the former being gradually replaced with a number of digitizing devices such as flat panel detectors and image plates. The medical X-ray detectors market is helped in no small part by the winning combination of continuous innovation leading to price reductions and better image quality as a result of technical advancements. The medical X-ray detectors market is projected to grow with a robust CAGR of 6.1% for the period 2017-2022, making it an extremely enticing prospect for key stakeholders. Direct flat-panel detectors account for a revenue share of more than a third of the medical X-ray detectors market and are anticipated to gain share over the course of the forecast period. Therefore, key stakeholders in the medical X-ray detectors market are advised to make their long-term business decisions keeping this in mind. 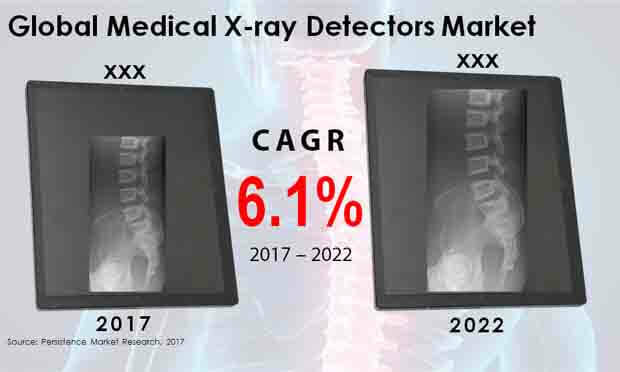 The direct flat-panel detectors segment estimated to be worth more than US$ 1.1 billion by the end of 2022 and thus companies need to be present in this critical segment of the medical X-ray detectors market. Both computed radiography and indirect flat-panel detectors contribute approx. a fifth of the revenue share in the medical X-ray detectors market at the end of 2017. However, the CAGR is considerably higher in the case of indirect flat-panel detectors and North America is anticipated to witness a boom in this segment. Line-scan detectors and charge-couple devices are comparatively niche segments in the medical X-ray detectors market by product type. It would be unwise to ignore them entirely though and companies would do well to target North America as it has the maximum regional contribution for both segments in the medical X-ray detectors market. The North America line-scan detectors market is predicted to push past US$ 150 million by end 2022. Europe closely follows North America in terms of size but the region to look out for in the future would undoubtedly be APEJ as an increasing focus on healthcare points to a bright future for the APEJ medical X-ray detectors market. Large-area flat panel detectors contribute a revenue share approaching two-thirds of the medical X-ray detectors market in terms of panel-size segment at the end of 2017. The most promising regions with maximum potential in this segment would be North America and APEJ as they are estimated to witness a robust CAGR in excess of 6%. Small-area flat panels account for the balance revenue share and companies looking to enter this segment are recommended to devise appropriate go-to-market strategies. APEJ in particular is projected to demand the most small-area flat panels. The Persistence Market Research report on the medical X-ray detectors market has profiled some of the prominent companies actively involved in the medical X-ray detectors market. They include Agfa-Gevaert, Onex Corporation, FUJIFILM Holdings Corporation, Analogic Corporation, Canon, DRTECH Corporation, Hamamatsu Photonics, KONICA MINOLTA, Rayence Co., and Teledyne Technologies Incorporated.